#874 Let’s learn English grammar through pop music. I found a textbook which looked interesting at a bookstore. 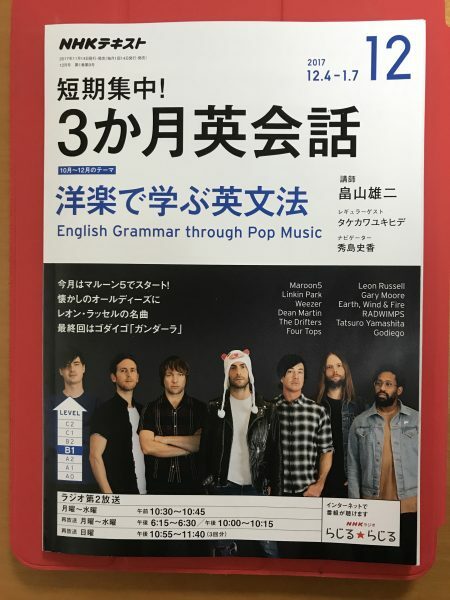 The cover of the textbook was Maroon5 who is a music band in the U.S. I picked it up and flipped through the book. A musician, Yukihide Takekawa appeared on the book. He is going to be a regular guest in the program. I like his songs very much. This program is going to showcase 12 songs to the listeners. Here are some songs from the list. “Sunday Morning” by Maroon5, “Numb” by Linkin Park, “Zenzenzense” by RADWINPS and “Gandhara” by Godiego. Listeners can learn the lyrics and the English grammar through the songs. In my case, the reason I started to learn English was because I wanted to understand English songs. When I was a junior high school student, I listened to a lot of English songs and began to like English. I decided to buy the textbook. I’m looking forward to listening to the program. Actually I’m going to listen to it on the internet.